The British back in the fifties and sixties tended to be a tad predjuced against American cars which were disparagingly referred to as “Yank Tanks”. The generic folklore that ran around them at that time was that they “handled like a wet sponge” and that their brakes were not up to the task of bringing those enormous machines to a stop. This was a curious set of prejudices from a nation whose pride and joy motoring marques included Riley, whose post war Riley Pathfinder quickly became christened the Riley “ditchfinder” for it’s unfortunate propensity for suffering broken rear torsion bars which caused the car to become un-steerable as it made its way off the road despite the best efforts of its hapless driver. Then there were the various Pininfarina badge engineered Austins, Morrises, Wolesleys and Riley’s of BMC with their reputation for excessive body roll in cornering and not so efficient ability to stop quickly. The British car industry was in the process of dying but both those within and without the industry were, I’m afraid, in a state of denial. 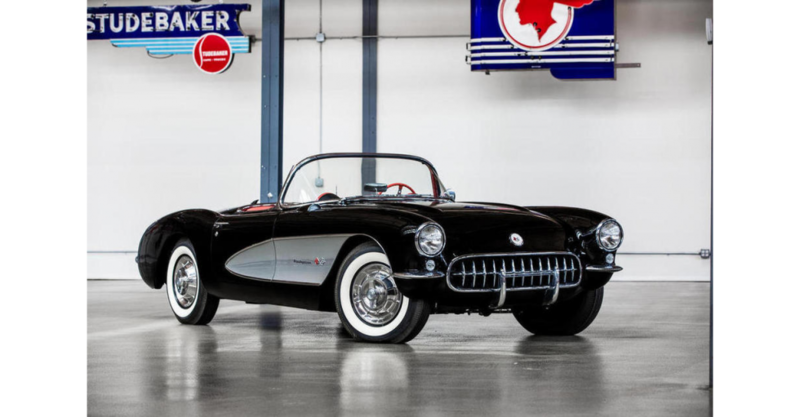 So it was when Chevrolet began producing the Corvette that it progressed to became an iconic hit in the United States but was looked upon with a measure of disdain in Britain and to a lesser extent in Europe. Even the television series “Route 66” wasn’t able to shift that “The British are best at everything” mindset, despite Nelson Riddle’s beautiful theme music for the series. Perhaps the people at Chevrolet got wind of the British/European snobbishness, or perhaps they just thought “why not?”, but it was decided to have a go at racing Corvettes at the prestigious Le Mans 24 hour motor race in France in 1960. 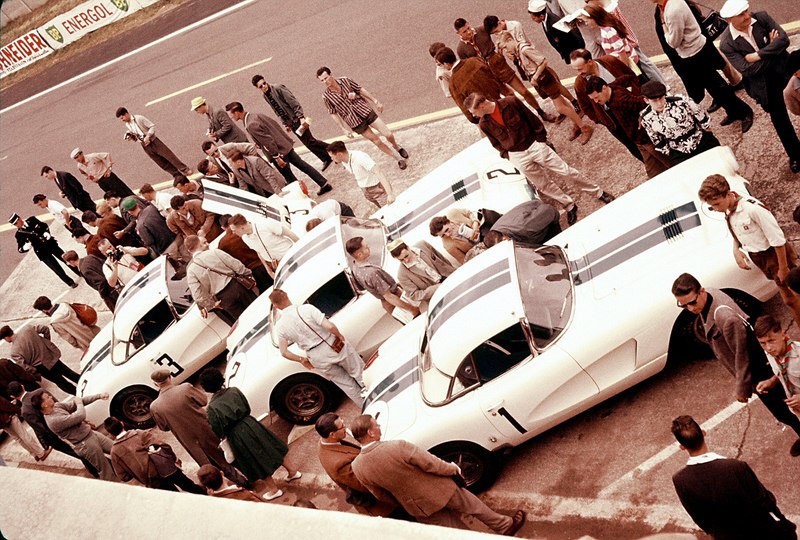 The Chevrolet Corvettes on the starting grid at Le Mans in 1960. (Picture courtesy of Lance Miller). This was smart thinking. Le Mans is about staying power combined with sustained speed, and a car with a big lazy V8 is near guaranteed to have staying power along with raw power. The “big lazy engine” formula was used by the Bentleys of the twenties to win at Le Mans again and again despite the cars having what can best be described as “horse and cart” leaf spring/live axle suspension and brake technology of the twenties. So, off to Le Mans Chevrolet did go and achieved success. You’ll find the story in the video below. The big Chevy achieved eighth place, so, although it could not compete with the likes of Ferrari (Americans driving Ferraris managed 2nd, 5th and 7th), it did successfully compete against Jaguar, Aston-Martin and Porsche. So, despite the disparaging prejudices of some, the brakes worked, the suspension worked, and of course that big 4.6 Liter V8 power-plant worked. The Corvette demonstrated that it was not a “Mickey Mouse” sports car. It held its own and surprised many. 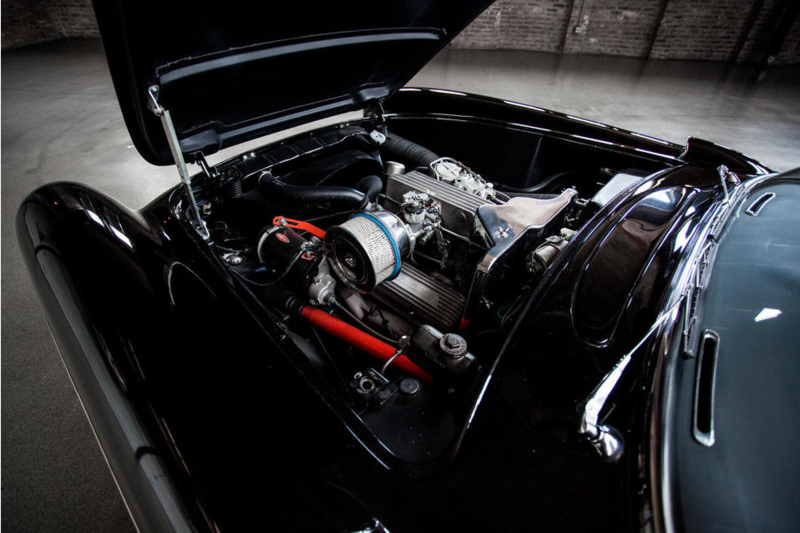 Engine for the 1957 Corvette was the 4.6 Liter V8, same base engine as used in the 1960 Le Mans cars. This car has the factory fitted optional Ramjet Fuel Injection. This car is one of the last fitted with the 3 speed manual transmission. In 1956-7 Chevrolet were really getting the Corvette up to being a credible sports car, after a shaky start which saw Corvettes being underpowered, hampered by a 2 speed automatic transmission and quality control problems with the fiber-glass bodywork which was subsequently replaced with steel. 1956 saw the earlier six cylinder engines replaced by the 4.6 Liter V8 and the three speed manual transmission becoming standard whilst the 2 speed Powerglide automatic became optional. If you’ve ever had the opportunity to drive a late fifties Chevrolet with the 2 speed Powerglide automatic transmission then you would likely wonder why anyone would consider fitting one in a sports car. It turns the car into a lethargic beast and, by putting all responsibility for stopping it onto the brakes, it makes it rather more difficult to stop. With a manual gear box the car is transformed into something you can really drive. As for it only being three speed, we should remember that the British Austin-Healey 100 of 1956 was also fitted with a 3 speed manual transmission, albeit with overdrive on 2nd and 3rd. 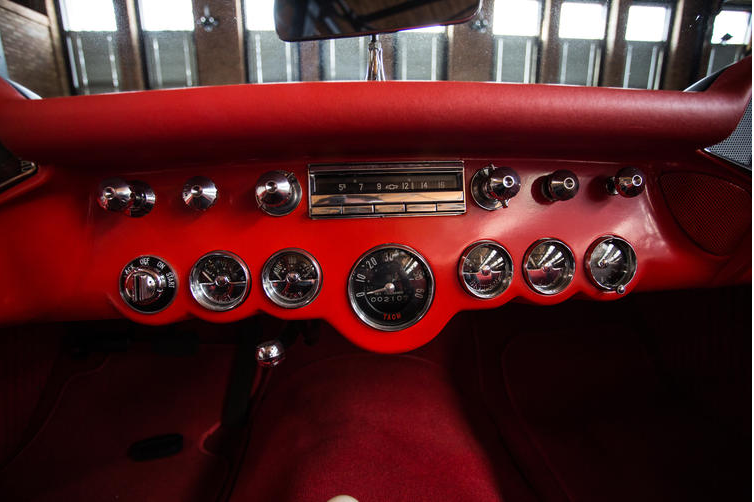 The cockpit of the 1956 Chevrolet Corvette. 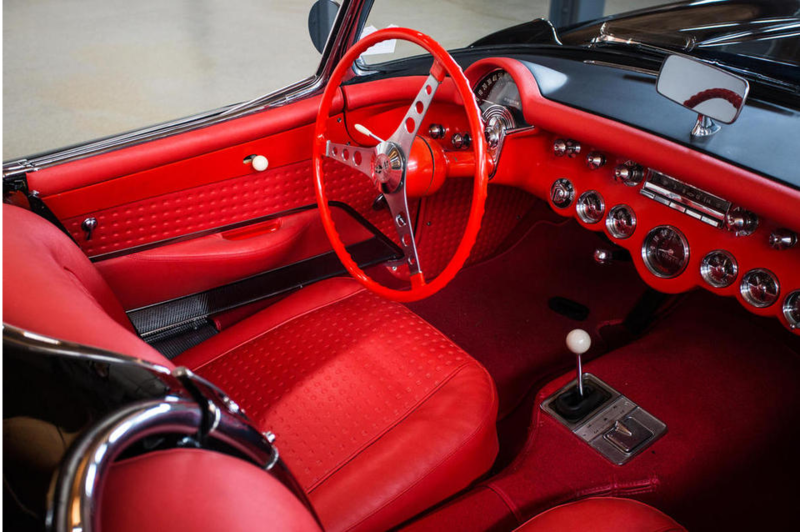 A real sports car interior despite the tachometer not being in the driver’s direct line of sight; something the early sixties Bizzarini GT America also didn’t do. No doubt Chevrolet realized that many Corvette buyers were not so much interested in a sports car as they were in a “sporty” two seat car that was stylish. People who really weren’t interested in a sports car driving experience, but more in appearances and fashion. The Corvette provided for both. The Corvette was intended to compete directly with Ford’s Thunderbird, which was not a sports car but a stylish two seat coupe and it did that successfully. The Chevrolet Corvette managed to successfully create a look that was at once both sports car and stylish coupe. As it was intended to directly compete with the Ford Thunderbird this was clever styling by GM. I occasionally think of flying to the states and hiring a Chevrolet Corvette with which to do Route 66 and I must admit it’s just such a tempting idea. It’s a “bucket list” dream that will likely not be moved into reality. It would be fabulous to do but, the Route 66 experience of the sixties is already impossible because the United States of the sixties is already gone. People have changed, the culture has changed; so even though the places are still there it couldn’t be the same. But would it be worth doing for the new experience? I think so. All that would be needed is some money, and a Corvette. 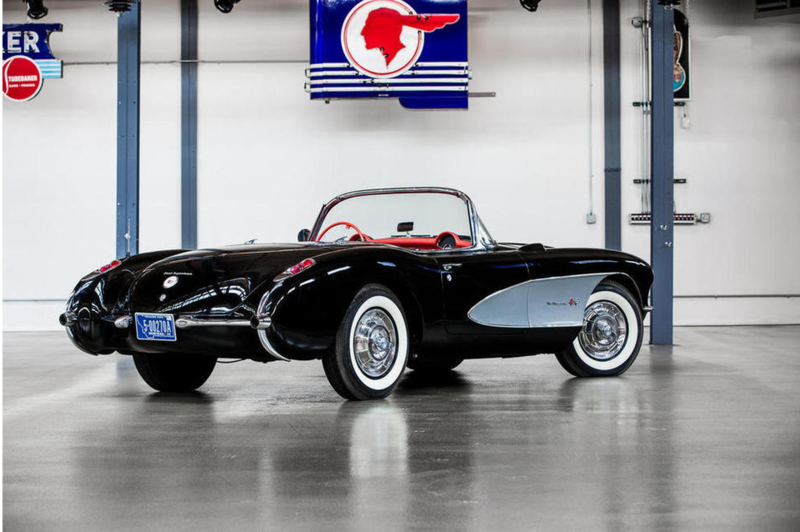 The 1957 Chevrolet Corvette we have featured is coming up for auction soon so, if you have the money and a desire to do Route 66 in the best possible way then this could be your chance to do it.